"Membership has its privileges" as the popular saying goes. Click below to learn more about our awesome membership opportunities & more! Celebrating Alabama’s history and our most notable African-Americans who made it! 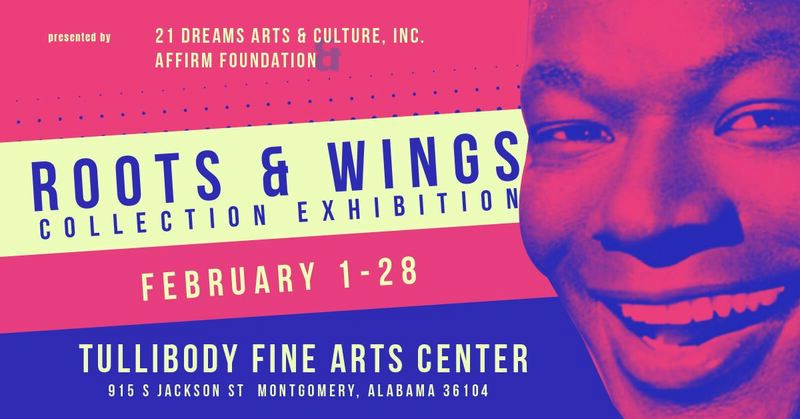 In celebration of the Alabama Bicentennial and Black History Month, 21 Dreams Arts & Culture, Inc. in partnership with the AFFIRM Foundation Project presented by Designer Perry Varner will open the Roots & Wings Collection Exhibition in Montgomery, February 1, 2019. This visual arts exhibition is FREE to the public and will be held in the Warren Britt Gallery at the Tullibody Fine Arts Center on the campus Alabama State University through February 28. The exhibiting artwork created by Alabama artists depicts the lives and achievements of some of our most notable African-American natives. Alabamians who expanded the narrative of success in professional sports, arts, politics, science, and culture as well as those who broke barriers to entry in education and business. It is designed to adequately tell the story of Alabama’s rich cultural history and give recognition to some of the highest achievers who were all born in the great state of Alabama. 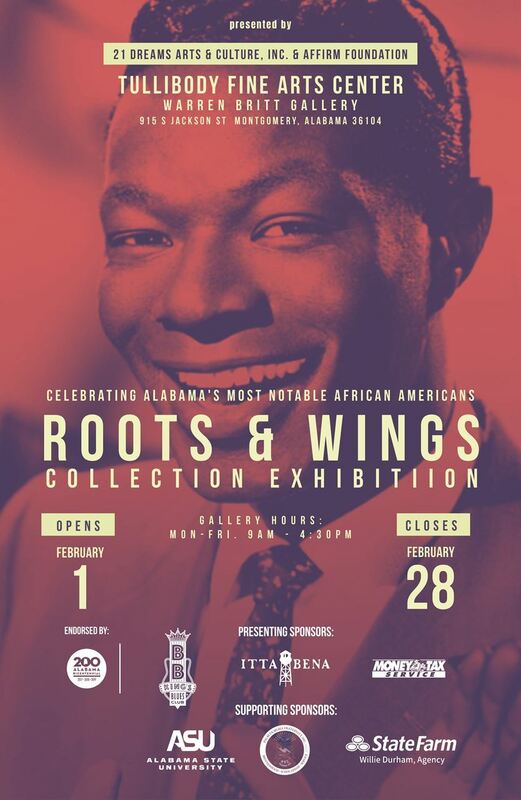 While launching in our State's Capital, the Roots & Wings Collection Exhibition will then travel to other cities throughout Alabama for 2019 into 2020. Celebrating Alabama’s bicentennial, the exhibit will showcase at several prominent museums, universities, public schools, expos, events and more. The Opening Reception sponsored by BB Kings & Itta Bena will be held Friday, February 1st at 5:30 PM in the Warren Britt Gallery at the Tullibody Fine Arts Center on the campus of ASU. On Saturday, February 2nd from 12pm to 4pm at the Tullibody Fine Arts Center, 21 Dreams and the AFFIRM Foundation will host the Roots & Wings Market Place featuring local artists, authors and artisans. Beginning at 2pm there will be an Artist Talk in the Warren Britt Gallery featuring several of the exhibiting artists! The Montgomery Roots & Wings Exhibition is sponsored and endorsed by the Alabama Bicentennial. A special thanks to our Presenting Sponsors: BB Kings, Itta Bena and Money Tax Services. And sincere gratitude goes out to our Supporting Sponsors: State Farm Willie Durham Agency, Epsilon Theta Sigma Chapter of Phi Beta Sigma Fraternity, Inc., and Alabama State University Visual Arts Department. More locations will be announced in the future.